This page provides you with Product Manager resume samples that you can use for inspiration in writing your own resume, or for creating one through our easy-to-use resume builder. Below you'll find our how-to section that will guide you through each section of a Product manager resume. Raise your hand if you believe product management is one of the most competitive and fierce professional fields of the last decade. We can see hundreds of hands raising at the same time across the world… this statement is as true as it gets! We get it, you love to be a product manager and you believe you have everything to get the job you have always dreamt of: at the same time, though, you must agree that you need the best resume to get over this crazy competition running in this particular field as we speak. Everyone wants to reach the top and you need the top Product Manager resume sample to inspire you build yours! Stand out from the others with VisualCV: over the last couple of years, we have inspired plenty of successful product managers, who have finally got their dream job. Do you want to be next? Let us help you! How to Write a Product Manager Resume? There are many positive benefits of including a summary with your resume: will you believe me when I say that plenty, too many resumes miss a summary? This is your chance to stand out from the crowd, this is your opportunity to introduce yourself to your future employer in 60 seconds. This is what you want and it’s not as difficult to achieve as you think. Customize your level of years in the industry. Keep focused on your skills rather than personal abilities. Talk about accolades or awards. Use language outdated with the times. Say you had lots of responsibilities, choose two or three only! In your resume, your work history section should essentially start off by discussing briefly your current role within a company. If you’re between jobs at the moment, talk about your last employment and what role you had, in depth.However, you could also talk about any previous experience that might help the recruiter know more about you. Include at least two work experiences. Let the recruiter know what you have enjoyed about these experiences. Showcase figures and percentages that demonstrate success. Avoid talking about bosses or previous employers. Explain why you were fired or let go from a past role. Talk about you if it doesn’t involve your work. Here is your chance to brag about what has allowed you to become the product manager you are right now! Let the recruiter know about the amazing experience you went through at university, or even those high school times when you realised you this could have been your future! Include as much relevant education as you can as employers enjoy reading about you. The name and location of the school or universities you studied with. The course name and the length of the course you completed. The degree or qualification name and the level of achievement. What you also should include here is any education or training you’ve received as part of your employment. Even if it’s just a day course, it still could be added here. It shows how much you have learned throughout your years in employment. Skills are crucial for anyone looking to become a product manager. This is your chance to shine because you are talking all about you and your talents. You want to make this section perfect because you want the employers to take notice of you and your skills as a potential product manager. Here, you can list any skill you believe you have – as long as it relates to the role of product manager – and you don’t have to be shy about what you write. However, try to keep the skill section fairly short. We don’t think it’s best to have one entire page devoted to your skills so list what you need but don’t drag it on. Also, soft and hard skills should be added and we can help with this part too. Be honest with your future employer. Use a writing style you can’t read! Opt for numerous different colors or fonts. Distract employers with information they don’t need. 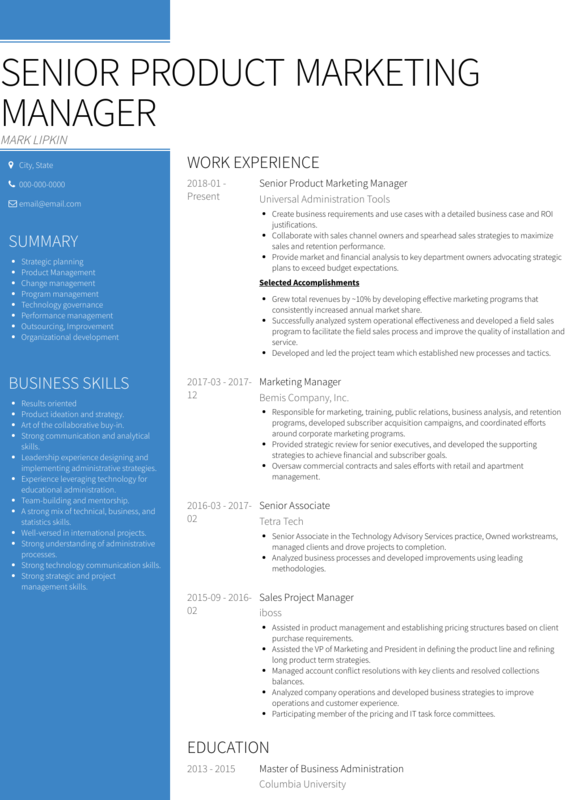 Thanks so much for your time: you now have access to standout product manager resume sample: if you are also looking for the best product manager resume templates, you should check this masterpiece we have been working on here : many professionals like you have successfully used it to take their career to the next level.